Ethiopia has said some 1,000 fighters with the Oromo Liberation Front (OLF) rebel group have given up arms and entered rehabilitation camps, according to state media. Popular among the largest ethnic group, the Oromo, the OLF fell out with the ruling Ethiopian People’s Revolutionary Democratic Front (EPRDF) in 1992 and soon began launching armed attacks. Last year, reformist Prime Minister Abiy Ahmed removed the OLF from a list of terror organisations, and its exiled leadership made a triumphant return home. “Parts of Oromia regional state, which had been suffering from unrest, are returning to normalcy, with OLF fighters giving up their arms and re-integrating back to their local communities,” Admasu Damtwe, head of communications for Oromia, told state media on Thursday evening. “The insecurity in parts of Oromia where OLF fighters used to operate had led to the suspension of basic government services including education, but now with OLF fighters abandoning armed struggle, the government can focus now on development works,” he added. His claim has not been confirmed by the OLF. 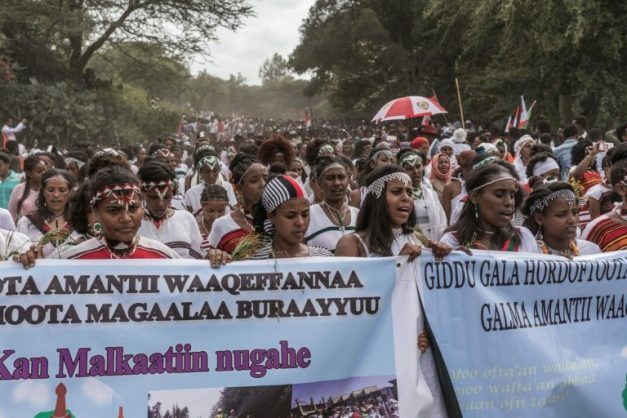 The deal between the government and OLF has run into trouble recently, with Addis Ababa deploying soldiers against armed members of the group it claimed were robbing banks and attacking residents in the remote west of the country. The OLF denied this, and has accused the government of failing to meet its promise of integrating its combatants into the armed forces.